BP provides a worldwide view of energy supply and demand through 2040 in its Energy Outlook 2018. The BP Energy Outlook explores the forces shaping the global energy transition. It indicates how rising prosperity is driving an increase in global energy demand and how that demand may be met over the coming decades through a diverse range of supplies including oil, natural gas, coal, and renewable energy. The fast growth in developing countries increases global energy demand by a third by 2040. Oil, natural gas, coal, and non-fossil fuels each contribute about 25 percent to the global energy mix in that year. 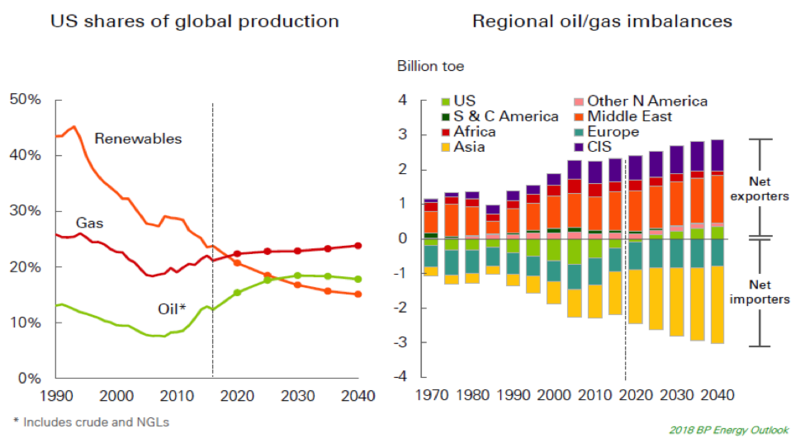 Oil demand increases over much of the forecast period and then plateaus in the later years. Natural gas demand overtakes coal as the second largest source of energy. Together oil and natural gas account for over half of the world’s energy. Global coal consumption and Chinese coal consumption both plateau. Renewable energy (excluding hydro) is the fastest growing fuel source, increasing five-fold and providing 14 percent of primary energy in 2040. BP projects that the United States will become energy self-sufficient in the early 2020s and maintain its position as the world’s largest producer of liquid fuels and natural gas. Natural gas is expected to become the leading U.S. fuel by 2040, accounting for 40 percent of domestic energy consumption—up from 32 percent today. U.S. gas production is expected to increase to 118 billion cubic feet per day—an increase of 46 billion cubic feet per day. 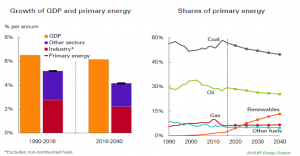 BP projects that renewable energy’s share of U.S. energy demand will be 17 percent by 2040, while coal will account for only 5 percent, and oil’s share will drop to 30 percent. BP expects renewables to surpass coal as the second-largest U.S. source of power generation by around 2030. BP expects U.S. energy production to increase by 39 percent by 2040; with natural gas production up by 65 percent, oil production up by 55 percent, and renewable energy up by 220 percent, more than offsetting declines of 48 percent in coal and 28 percent in nuclear power. While the United States becomes a net exporter in the early 2020s, its net exports represent only a small fraction of world trade because the United States is a large consumer of natural gas and oil. The U.S. share of global oil production (crude plus natural gas liquids) increases from about 12 percent today to about 18 percent by 2040, which is above Saudi Arabia’s expected market share of 13 percent in 2040. BP expects the United States to account for 24 percent of the world’s natural gas production in 2040—above Russia’s share of 14 percent. The United States is forecast to fall behind China as the largest producer of renewable energy with its share of global production declining from 24 percent today to about 15 percent in 2040, while China’s share increases to about 30 percent by 2040. BP expects China’s energy demand to grow by 1.5 percent per year during the forecast period—less than a quarter of its growth rate over the past 20 years. 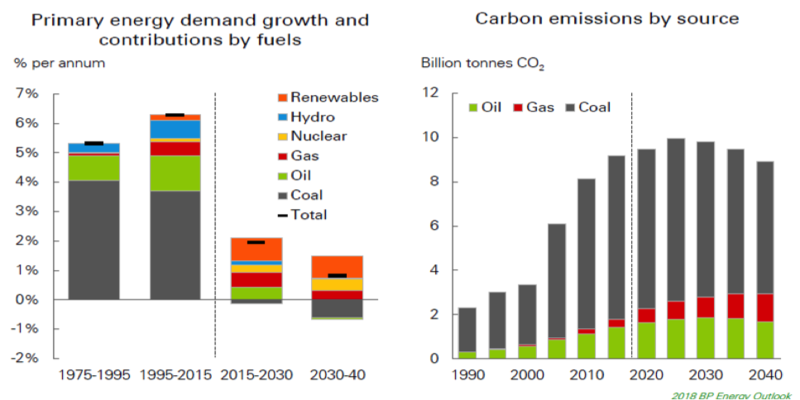 BP also expects China’s energy mix to change significantly due to a changing economic structure and its commitment to the Paris agreement to move toward less carbon fuels and peak in carbon dioxide emissions by 2030. China’s coal consumption is projected to fall over the forecast period in contrast to its coal use over the past 20 years. BP expects renewable energy, nuclear, and hydroelectric energy to account for over 80 percent of the increase in China’s energy consumption through 2040. Renewable energy is expected to overtake oil as the second largest energy source in China. The shift in energy usage results in China’s emissions peaking in the mid-2020s in BP’s forecast. BP expects India to be the largest growth market for global energy. Coal is expected to provide the major source of energy, accounting for 45 percent of the increase in energy demand. Over 70 percent of the increase in global coal consumption is to fuel India’s power sector so that electricity is provided to more of India’s population. BP expects India’s natural gas consumption to almost triple to support industrial sector use, including as a feedstock for the production of fertilizers. BP expects renewable energy, particularly solar, to increase significantly in India’s generating sector. 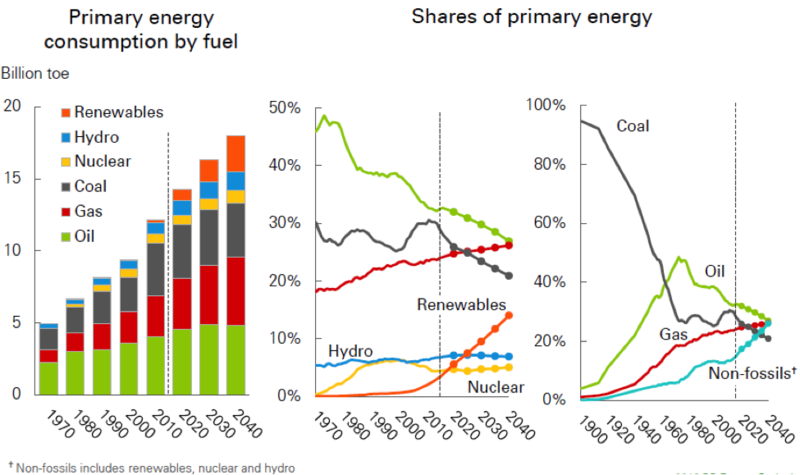 Despite the growth in several fuel types, only India’s renewable energy share increases. 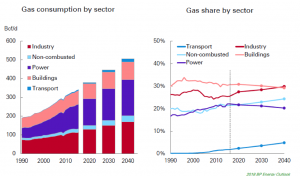 Growth in natural gas demand is primarily due to the industrial and the power sectors. Growth in the industrial sector is due to continued industrialization in developing countries and movement away from coal. 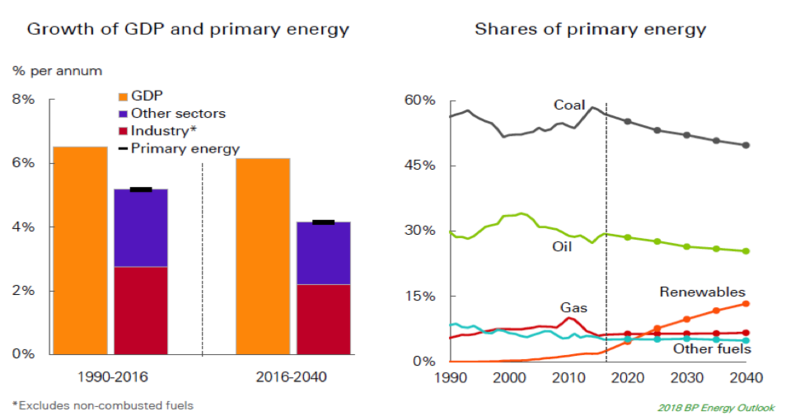 Growth in the power sector is due to increased demand for electricity, but natural gas’s share does not increase as coal and renewable energy also compete for the power sector market. The fastest rate of growth in natural gas demand is in the transport sector as natural gas is increasingly used in trucking and marine transport. The share of natural gas in the transport sector increases to almost 5 percent by 2040. BP expects LNG to more than double over the forecast period. LNG exports are dominated by the United States and Qatar, which account for almost 50 percent of global LNG exports by 2040. Australia, Russia, and East and West Africa are also LNG exporters. On the import side, China and some smaller Asian countries, such as Pakistan and Bangladesh, represent growing areas for LNG. Europe remains a key market for both LNG and pipeline imports of natural gas. 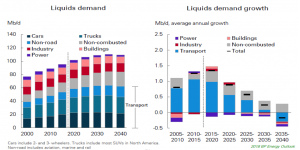 The global demand for liquid fuels increases by 13 million barrels per day, reaching 109 million barrels per day by 2040. After increasing, it declines slightly and then plateaus. All of the demand growth comes from emerging economies, with India replacing China as the primary source of growth in demand. Non-OPEC supply is expected to increase by 5 million barrels per day with U.S. supply accounting for more than that level as Brazil and Russia’s production offset declines in higher cost mature regions. OPEC’s output increases by about 6 million barrels per day, representing a total increase of 11 million barrels per day in global supply—less than the increase in demand due to excess liquids supply in 2016. 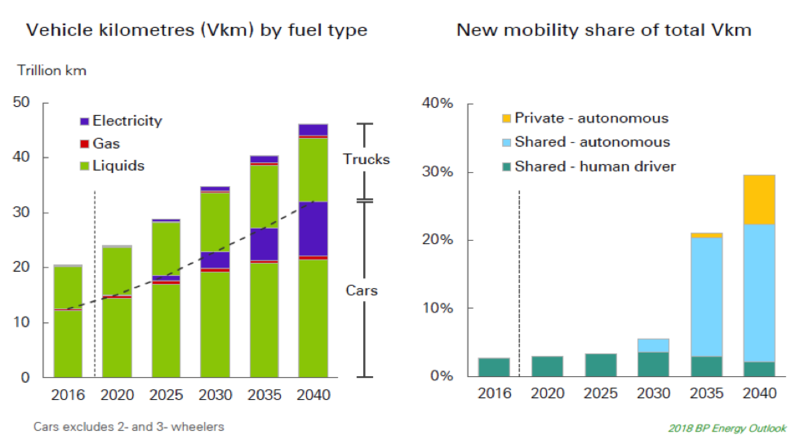 BP expects the number of passenger cars to increase substantially by 2040, with an increasing number of electric cars and a major improvement in vehicle efficiency. The company expects the car park to almost double to 2 billion cars by 2040, including over 300 million electric cars. 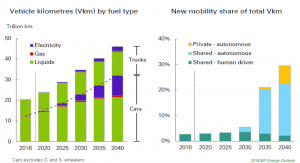 It expects about an equal number of plug-in hybrids and battery electric vehicles. The efficiency of the global car park is expected to improve by 2 to 3 percent per year during the Outlook period due to tightening regulations and government targets. BP expects new cars in 2040 in the European Union to be about 70 percent more efficient than in 2000. But, liquid fuels remain the major source of fuel for the transport sector. BP expects electricity consumption to grow strongly with 70 percent of the increase in primary energy attributed to the power sector. Global electricity demand is expected to grow three times more quickly than other energy. Renewable energy accounts for about half of the increase in power generation and its share of total power generation increases from a 7 percent share today to around a quarter by 2040. Coal only accounts for 13 percent of the increase in global generation compared to 40 percent over the previous 25 years. But coal remains the largest source of power generation in 2040 with a share of almost 30 percent. The share of natural gas in electricity markets is expected to be relatively flat providing a little over 20 percent of global generation through the forecast period. 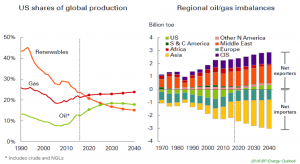 BP, like Exxon Mobil’s Energy Outlook and EIA’s International Energy Outlook, expects the world to continue to consume oil and natural gas, which are expected to supply over 50 percent of the global market in 2040. 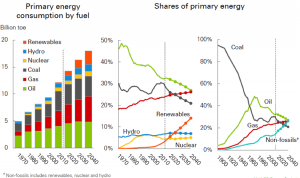 Coal falls in share and renewable energy increases. Developing countries use coal, natural gas, and renewable energy to provide electricity to more of their populations. Electric vehicles make a dent in the transportation market but liquids are still the major fuel needed to supply transportation demand.